Art Brokerage has 60 well priced listings for artist Yaacav Agam. 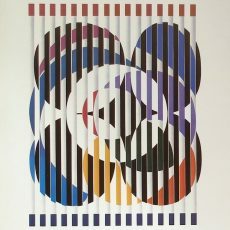 Born in 1928 -Artist Yaacov Agam was born in Palestine and was educated at the Bezalel School of Art in Jerusalem as well as the Atelier d'Art Abstrait in Paris. Agam has dedicated his creative life to the exploration of diverse relationships between art and technology. Using complex, seemingly scientific combinations of shapes and colors, Agam is able to create a multitude of illusions, each meeting the viewer at his particular vantage point. 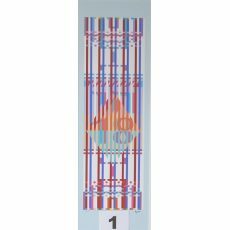 Among the awards Agam has received are a special prize for art research at the Sao Paulo Bienal in 1963 and first prize at the International Festival of Painting at Cagnes-surmer in 1970. 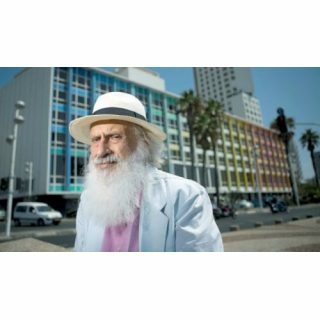 Agam has had exhibitions at the Tel Aviv Museum, the Musee National d'Art Moderne in Paris, and the Stedelijk Museum in Amsterdam. Agam's work is in the collections of many museums, including the Museum of Modern Art in New York and the Joseph Hirshhorn Collection in Washington, D.C.